"Chasselas - Féchy to Dézaley" is a superb book about wine, it also offers traditional recipes of Vaud, easy to prepare and which go perfectly with the Chasselas. Most of the illustrations in this book come from Paul Boesch's book "La Grande Année Vigneronne", published in 1935 by the editions of Verseau, Roth & Sauter Print Center SA Denges. It consists of twelve woodcuts (black and white and color) illustrating the daily work during a year in the vineyard of Vaud. The current photographs of the vineyard are made by photographer Patricia von Ah. This magnificent book presents 99 Chasselas, classified by region. He proposes for each wine, the tasting notes, the technical data and the portrait of the estate. 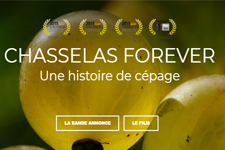 Every generation has laid down the culture of Chasselas. A relationship to discover rooted in a long history. This book is a beautiful tribute to Chasselas and the successive evolutions of the work around this grape variety. This grape made the happiness for the table of the Ottoman sultans. At the table of François 1er its cluster crowned with luxurious meals. It fed for a long time the stories and the legends. Scientists, historians and wine growers lift the veil on the origin of this symbolic vine of French-speaking Switzerland. From Constantinople up to the vine arbour of the Roy of Fontainebleau, following the banks of the Loire, exploring the Burgundy and the vineyards of French-speaking Switzerland, the mystery of the chasselas grape shows itself at the rate of the epic. Never the camera had also approached near a grape, never vine had so much been sounded by the genetics. Of the pip to the Grand Cru, of the infinitesimal to the universal geography, the history of the chasselas grape as you have never seen it.